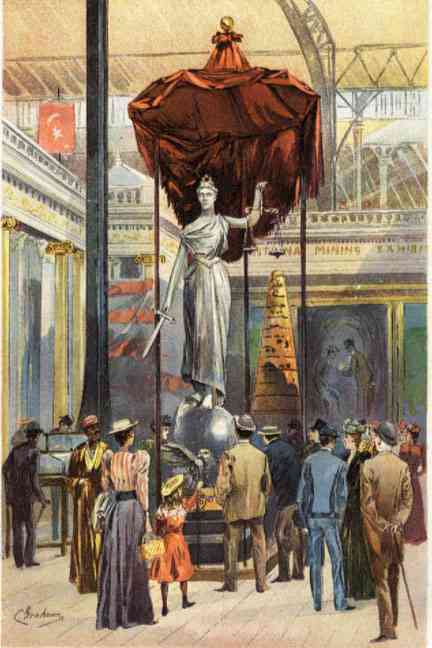 Standing an imposing 12 feet high (see notes) is the fabulous sterling silver sculpture of Justice in the Montana pavilion of the Columbian World Fair in 1893.
holds the scales of Justice in her left hand while her right hand carries a sword. The expression on her face was changed to a more severe image to reflect the idea of justice. all of which are resting on a two square foot plinth of pure gold. The gold for the plinth was mined at the The Spotted Horse mine which is located one mile east of Maiden on the west side of Maiden Canyon, Montana. The silver was borrowed from W. A. Clark of Butte, Montana and Samuel Hauser of Helena, MT. The statue dominated the Montana pavilion and was one of the 'must see' items at the fair. This was the largest and most expensive silver sculpture ever produced in the world and was made from a life size mold created by sculptor R. H. Park of the voluptuous figure of Ada Rehan, a famous actress. The mold was made of baked French clay which was buried in a pit. A distinguished group of Columbian World Fair executives, geologists and foundry workers watched as the molten silver was slowly poured into the mold. An hour later a beautiful white metal sculpture was taken from the mold. Mrs. Clara McAdow was an extremely successful businesswoman from Billings, Montana and also a member of the ladies delegation headed by Mrs. Potter Palmer. She spearheaded the program to raise money for the statue and the exhibition. placer gold, and two hundred examples of crystallized gold. Remarkable quartz crystals, wire silver, and many other choice mineral specimens were also represented. 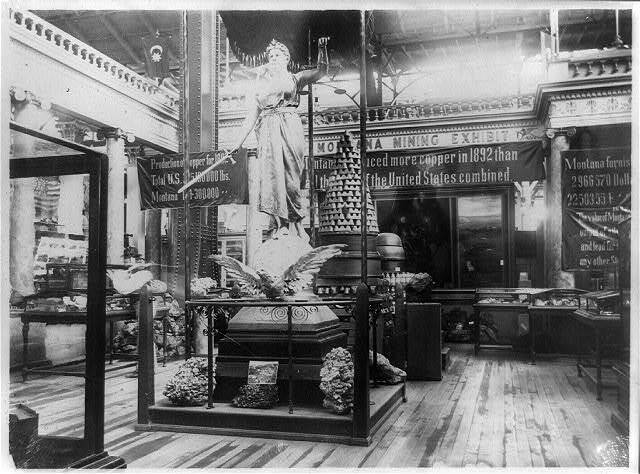 At the end of the fair, the statue traveled to various county fairs and stores and eventually ended in Omaha where it was consigned to a smelter and melted in 1903. The spoon also has a bowl picture of a miner holding a pickax while standing upon a rock. A search for this jeweler yielded several advertisements for various other silver spoons. Notes: The silver statue itself was 5' 10 and 1/2" high and composed of 24,000 ounces of sterling (about 22,200 ounces of pure silver) worth about $23,000 when it was cast and less than $14,000 by the time it was put on display (approx. $750,000 now). The gold plinth beneath the statute was made of almost 12,000 ounces of gold, over 800 pounds, all from the Spotted Horse mine at Maiden, in the Judith Mountains of central Montana. The value at the time was $242,000, or more than ten times the silver value. That would be over $20 million today. The gold was lent by Clara McAdow, who ran the mine for her wheelchair-confined husband, Perry. The plinth was returned to the Spotted Horse immediately after the fair. At the entrance to the Montana Exhibit was a large specimen of ruby silver in quartz from the Granite Mountain mine near Philipsburg. The Granite Mine specimen was 4307 pounds, 975 ounces of silver per ton. I thank Larry C. Hoffman, P.E. for his detailed information and helping me correct some factual errors.